After the introduction of the Fantasi 44, there was some demand for other models, mostly for a bigger sister but also from a few customers asking for a smaller version. One of the customers was Italian, hence the flag in this illustration. This design was a quick draft made in the spring of 2000. She almost resulted in a production boat but the project did not have the necessary funding. 1 Most cruisers were of the ‘upstairs / downstairs’ kind of boats (where you would be downstairs in a relatively dark main cabin, rather cut off from what was happening outide. 2 A few, like the Oysters, were deck saloons, where you would still have a downstairs main cabin, but with a raised roof and bigger windows. With this 41′ design, I continued the same basic path as the Fantasi 44 but wanted to take things quite a bit further. 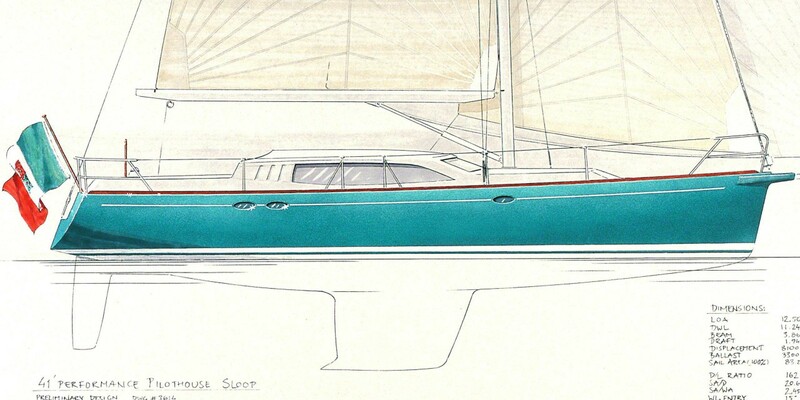 I wrote back then that “she is conceived as a somewhat unusual cruising yacht with a potential for very fast passages. Her character will be that of a medium displacement cruiser racer, she will be responsive and rewarding to sail. Still, for a cruiser racer, her Coupé configuration sets her apart“. In order to complete that kind of character, she had an open transom and her styling features had more in common with those of a cruiser-racer than what you would expect in a cruising boat in those days. 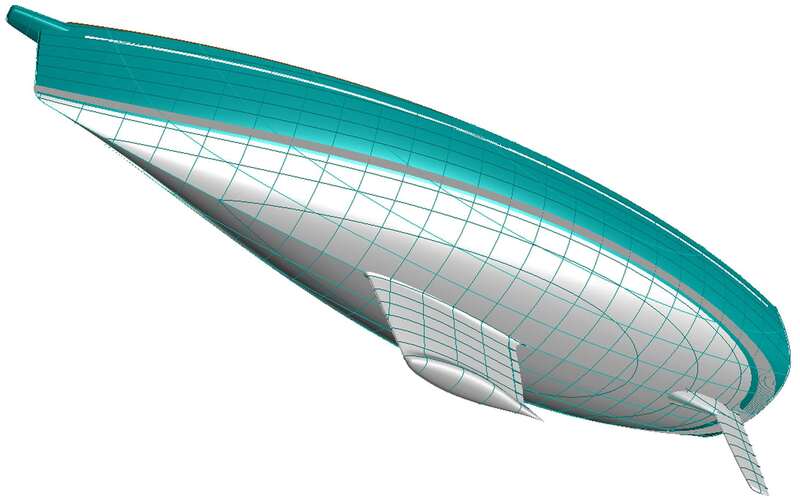 In addition, the idea was to make two 400 litre fresh water tanks centrally, one each side, and to be able to shift water to leeward before a tack so on a long leg, you could have all the water to windward, making her a little more powerful. I felt (and still maintain) that, for a cruiser, draft had to be kept within reasonable limits. 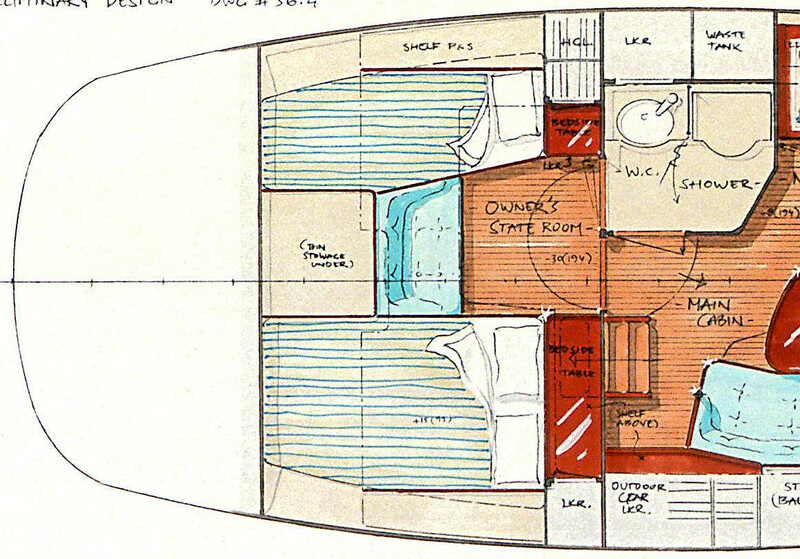 Her interior layout was different from what I had seen in the past, and I still cannot think of any yacht with a similar basic layout. She was given a wonderful aft cabin, much like the Fantasi 44, with a double berth and a spare berth, but this time even more generous, and with a private entrance to the head / shower. A footnote: It must be understood that an aft cabin like this, in a yacht with a good, secure, big and deep aft cockpit, cannot be compared to an aft cabin in a centre cockpit boat. Further forward, the main cabin was a little raised, particularly on the starboard side so, from there, it was overlooking the heads compartment. The heads were one step down and thus didn’t have to extend all the way up to the pilot house roof. There was a void above it so you could actually see past it – a place to grow some flowers or herbs, perhaps? There was no inside steering position; instead, on the port side, was a generous office. Further forward, one step down, a sizable galley. And then, opposite the galley and forward / downstairs from the main cabin seating, there was a private sofa for a drink before dinner, reading a book or having an afternoon nap. Then, finally, I wanted to create a boat with a character which was more modern, more playful, with clean, easy lines. And, because I was then interested in vintage Ferarris, as a nod to the 275 GTB, there were three gills behind the big side window, offering good ventilation in the aft cabin and the heads. Looking at this design today, one of the drawbacks is the main entrance which in its present form would be a little awkward, being raised at the forward end of a bridge deck. 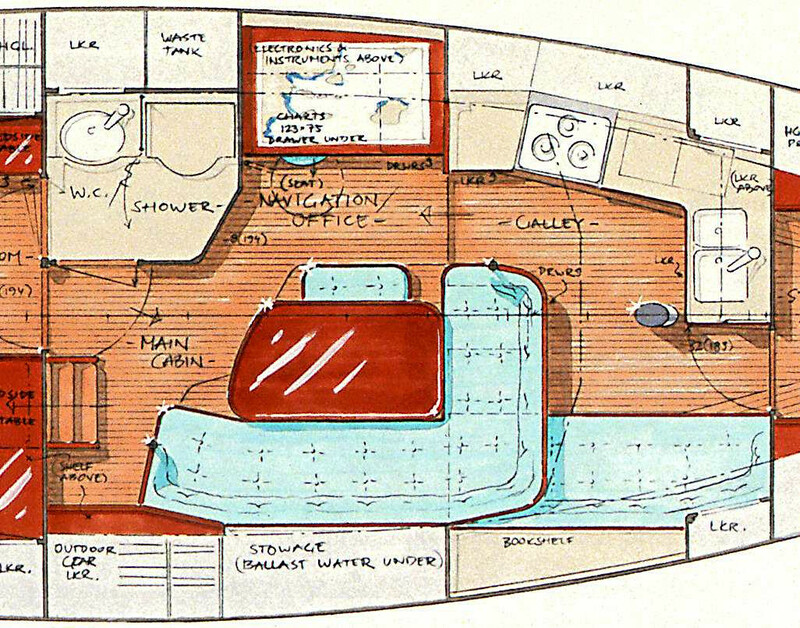 Maybe the forward part of the cabin should be mirrored, with the galley to starboard and the sofas still staggered, but on opposite sides. 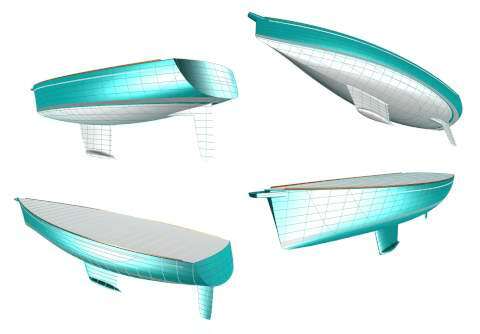 And her design does not feel really right – I would love to go back and change her a little – raise the freeboard a trifle forward, make both bow and stern a little more upright and give her an even more competitive, powerful hull. And I would work more on those pilot house windows. Still, this design could without doubt become a lovely cruiser, with a great personality.